Click “Sign Up”, fill out the form, and get the emmy app bam! 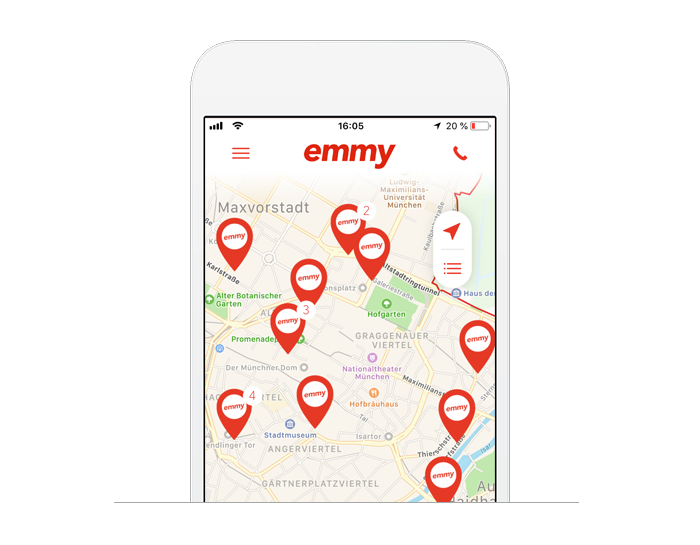 Over 1000+ scooters in Berlin, Hamburg, Munich and Dusseldorf are now at your fingertips. Sweet! After signing up, you’ll need to verify your driver’s license. You can do this within the app. This is the last and final step before you’re off! It’s time to start your engine! Locate a nearby scooter in the app, reserve it free of charge, and hit the road. Once you’ve reached your destination, park Jürgen, Horst or Lise anywhere within our business area and simply “Return”. Click “Sign Up”, fill out the form, and get the emmy app bam! Over 1000+ scooters in our cities are now at your fingertips. Sweet! After signing up, you’ll need to verify your driver’s license. You can do this within the app. Locate a nearby scooter in the app, reserve it free of charge, and hit the road. Once you’ve reached your destination, park Jürgen, Horst or Lise anywhere within our business area. Whether you prefer hanging out around Univiertel or you have your roots in the Glockenbachviertel – our business area covers the whole city center and because of our island solution you can also get easily to Flaucher. Au-Haidhausen, Altstadt-Lehel, Ludwigs- und Isarvorstadt, Maxvorstadt, Schwanthaler Höhe und Schwabing are also included. Your pal, office-buddy, or beau wants to tag along? We’ve got you. Every emmy comes with two helmets (in M and XL), which also include one-time-use helmet liners for all the germaphobes out there. …AND BYE BYE PARKING SLOG! The quest for parking is like a home game with our scooters. Its best if you place them on the side of a walkway. But there are a few things to consider: Never park in an entrance, no-parking-zones or in the backyard. Please always keep in mind to never hinder other road users. A quick jaunt to the Döner shop around the corner or a joy-ride with granny on back You’ll never pay more than 19 cents per minute to ride – even for two! 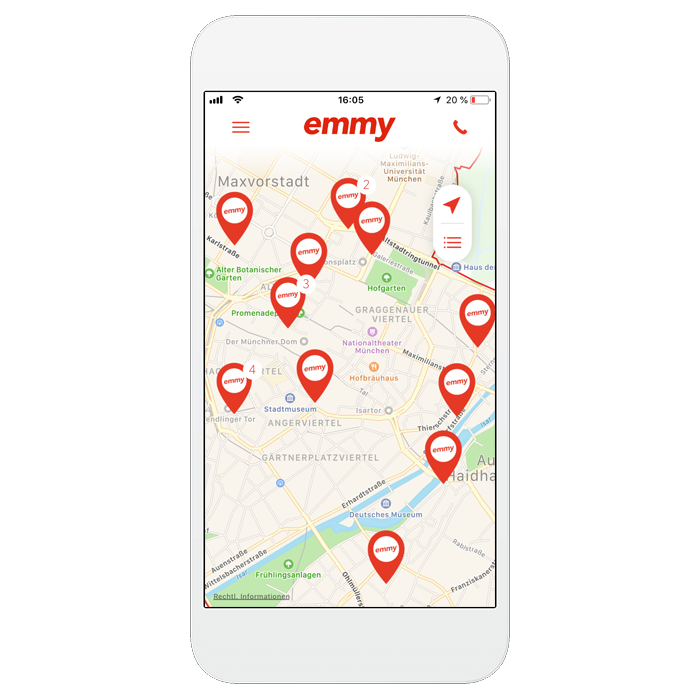 Refer a friend to emmy and earn 15 free minutes of ride time for each friend who joins. 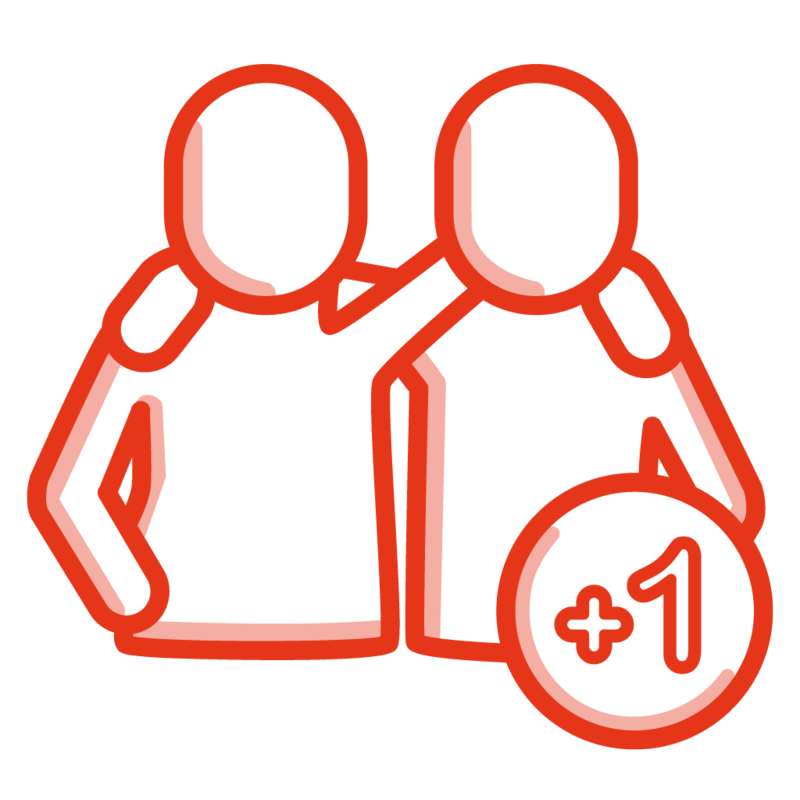 But don’t worry, your buddies won’t be left empty handed: they’ll also get 15 free minutes when they sign up!